Similar to conventional biodiesel, renewable diesel fuel is derived from biomass feedstocks, including animal fats and oils. However, unlike biodiesel, renewable diesel fuel is produced using a different process and maintains physical properties and performance similar to petroleum diesel, meeting the same ASTM D975 standard. Renewable diesel fuel offers several environmental benefits to customers, including reducing particulate matter. A life cycle analysis of renewable diesel fuel conducted by the California Air Resources Board also demonstrated reductions in greenhouse gases by 15 to 80 percent, depending on feedstock source used. Customers can also save money with renewable diesel fuel, as it requires fewer maintenance costs compared to other alternative fuels. The addition of renewable diesel fuel adds to Mack’s alternative fuel offerings. 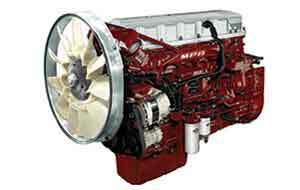 The Cummins-Westport ISX12 G natural gas-powered engine is currently available in Mack Pinnacle DayCab model. The Mack LR and Mack TerraPro cabover models also offer natural gas options with the availability of the Cummins-Westport ISL G engine. Mack Trucks has approved the use of renewable diesel fuel in all Mack engines. With performance similar to petroleum diesel, renewable diesel fuel delivers additional benefits for customers, including reduced greenhouse gas and particulate emissions, as well as decreased maintenance costs. Dedicated to quality, reliability and total customer satisfaction, Mack Trucks, Inc., has provided its customers with innovative transportation solutions for more than a century. Today, Mack is one of North America’s largest producers of heavy-duty trucks, and Mack trucks are sold and serviced through an extensive distribution network in more than 45 countries. Mack trucks and diesel engines sold in North America are assembled in the United States. Mack manufacturing locations are certified to the internationally recognized ISO 9001 standard for quality and ISO 14001 standard for environmental management systems. Mack is also a proud sponsor of Share the Road, an American Trucking Associations' public information campaign aimed at enhancing the safety of our nation’s roadways.